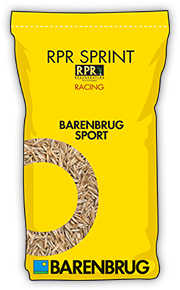 RPR SPRINT is a 100% perennial ryegrass seed mixture speci cally formulated for the unique demands of racecourses. The blend includes a variety of ryegrass breeding material, including a regenerating stoloniferous cultivar, a forage type and a tetraploid. Fast establishment, strong and robust growth and superior recovery from wear are the key requirements when renovating or divoting turf on a racecourse. A major difference between equestrian surfaces and other sports is the mowing height at which the sward is maintained. The STRI/ BSPB Turfgrass Seed Booklet trials grasses at 4-7mm, 10-15mm and 25mm, which is of little practical use to racecourse grounds managers. RPR SPRINT is designed to be maintained at 60mm+ height of cut, which allows broader-leafed and faster growing varieties to be utilised. Copeland is actually a forage perennial, but one with excellent sward density, leaf spot tolerance and persistency. Double is a tetraploid amenity ryegrass; again offering fast growth and performance for higher heights of cut. Barorlando and Barcristalla have superior wear tolerance properties and excellent recovery at all heights of cut. Barlibro is a Regenerating Perennial Ryegrass (RPR) that produces stolons as it establishes and grows. The lateral growth habit results in fast establishment between seeding lines, unparalleled capacity for recovery from wear, and additional traction strength in the sward.